For many users, Google is the primary filter through which they received information, and Google has always been at the forefront of data trends and search innovation. One of such innovations is the pulling of data from webpages and making them accessible right on the search result page. Already we can type in words, celebrities, foods, and other popular topics, and have a summary of the query right on the top of the search page (this is called OneBox results), making a trip to the actual webpages themselves unnecessary. For those not looking for a highly detailed rundown, but just basic information, this innovation makes the search process quick. The summary is pared down to the essentials without the bells and whistles of a full devoted webpage and the time spent browsing through them. The latest and greatest development in this functionality has been to include restaurant data, changing the way consumers search for restaurant menus and interact with that information. 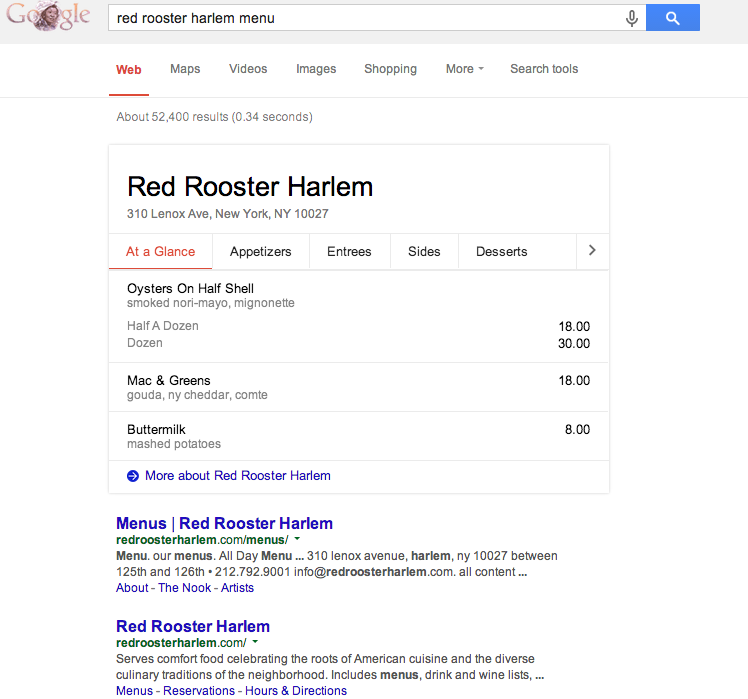 For those that are simply looking for a restaurant’s menu and instead find themselves flustered by the website’s animations and slideshows, Google is now displaying menus of the restaurants you search for right on the top of the search page. Although menu aggregators such as Allmenus.com are not exactly new, their third-party nature prevents them from competing with the immediacy offered by Google’s OneBox results. By simply typing in the Google search bar some combination of “menu” and the restaurant name, you’ll receive the food items at a glance. It even has tabs for different parts of the menu, depending on how the restaurant organizes it, all presented in a simplified, functional format. As the latest in the data trend towards efficiency and immediacy of information relay, the feature can be a real timesaver for consumers who find themselves making last minute and hurried dining decisions. The feature, which uses restaurant data to change the way these establishments interact with their consumers, means big news for restaurants and menu trends as well. Restaurants may find their carefully curated website getting less visitors as the Google search function obviates the need for consumers to actually visit the page. With their menus as the first (and sometimes only) impression, these restaurants may also find the need to spruce up their menu descriptions (or the menus themselves) to attract consumers, without the aid of fancy pictures and graphics. Alternatively, those eateries with delicious sounding menu items and lackluster websites may find their business inexplicably improved. Whatever the effect of the new function, which will certainly influence menu trends, restaurants will need to be diligent and flexible to respond to this change in how consumers will be viewing their menu. The restaurant industry is one of the most volatile industries in business, as new restaurants open and close each day. If you are looking for up to date information on the restaurant industry, or restaurant operator data, please get in touch with CHD Expert to see if you can benefit from access to our restaurant database.